PUMP ROCKET MINI is a scaled-down version of our popular PUMP ROCKET. This one appeals to any junior astronaut (age 3 years & up) with visions of reaching the stars. Countdown begins when a rocket is placed onto the end of the launch tube. 3, 2, 1 Blast off! Simply pump the launcher and watch the rocket lift off in a burst of speed and soar up to 30 feet into "space!" No worries about hitting the dog or a ceiling, because the ultra soft foam tips let them be launched indoors or out. Set includes pump launcher and one rocket with stabilizer wings. 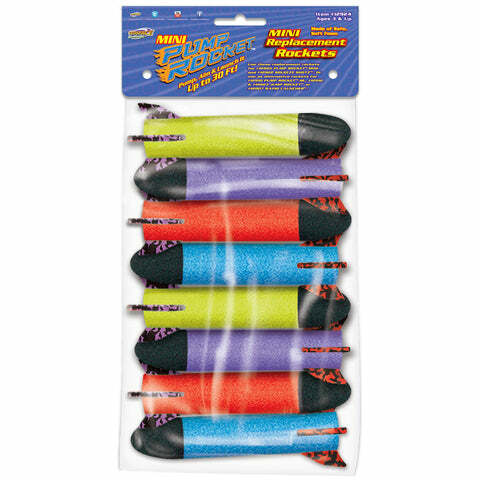 Additional Extra Rockets are available separately (see link to Mini Rockets 8-pack, item #12924, below). Approximately 19.5" long. Perfect for the little ones. Great Birthday Party Favor! This is a fun little pump rocket for kids and adults alike. Package Dimensions: 2" x 2" x 19.5"
Extra Rockets come in handy -- they add extra FUN, and are great to have on hand in case a rocket ever gets lost (they have been know to find their way onto a roof or into a tree!) These Mini Replacement Rockets , #12925, are compatible with ALL Pump Rocket Mini items.